The Latino vote is considered by both major parties to be a formidable force in the presidential election, with some predicting that as many as 12 million Latinos will turn out to vote. There’s no question it will be a close, hard-fought campaign coming down to a handful of swing states. Despite differences over policy, Republicans and Democrats both agree that Latinos will be the deciding factor in several of these electoral battlegrounds, including Florida, Nevada, New Mexico and Colorado. 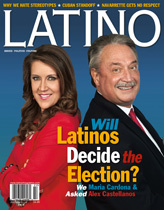 LATINO Magazine brought together two leading Latino political strategists, Democrat María Cardona and Republican Alex Castellanos, to talk about the Latino vote and why both parties are paying such close attention to us. Why should Latinos vote for Democrats? Why should they vote for Republicans? María Cardona: I have long held the belief that the Democratic Party has historically been the party that has fought for the interests of the Latino community. In fact, when I first started my political career I was the first Hispanic media director for the chairman of the Democratic Party, Ron Brown. He understood that ... this was where the growth was going to come from for either party. And through that work I came to believe that it’s the Democratic Party that represents the key issues that actually help the Latino community live a better life in this country. It’s the Democratic Party that fights for these issues and the one that puts forward policy points of views that will give Latinos in this country the tools to take care of their family and be able to give their children the American dream. The health care act gives nine million Latinos access to health care, and the first thing that Mitt Romney has said he will do when he gets into office is repeal it. Again, that goes against the interests of Latinos. This administration has given 16 tax cuts to small businesses to help them continue to create jobs. On immigration, I believe, Republicans have been on the right side historically, starting with Reagan, but since then we have seen a lurch to the right. Right now we see absolutely no Republican senators supporting comprehensive immigration reform. That’s why I think Latinos should support the Democratic Party. Alex Castellanos: Instead of just talking about issues, I think there’s a bigger reason that Latinos should vote for Republicans. All of us, whether Latinos or not, came to this country to be the best that we can be, to achieve the things we dream about. And this was the place. I think that’s especially true of Hispanics who came here with an aspiration that they can make things better not only for their families but for their community. And I think that still remains the difference between the two parties today. I think the Republican message to Hispanics is that what makes you special is that you are an American, not that you’re different than other Americans. I wouldn’t urge anyone to abandon the things in their heritage that make them unique and which you can all be so proud, but the things that we have in common at the end of the day are larger than the things that sometimes drive us apart. And if you believe that those big things should be accessible to everybody, if you believe that not because you are Hispanic but because you are American, then I think the Republican Party is for you. I think the Democratic Party sometimes makes the mistake of telling Hispanics that you can’t do it without special help. And I think that demonstrates a lack of faith. I think having that faith in people is the secret of Republican success with Hispanics. And what do you say to the notion that Republican Party is moving too far to the right, or that the Democratic Party is pandering to the Latino voters? Alex Castellanos: I think the country is like a boat, that when we’re dead in the water and the boat’s not moving forward and we’re running out of supplies, sometimes it brings out the worst in us. In that situation, we turn on each other. And I think it’s hard to solve the immigration issue within that box. You can’t litigate your way when you’ve exhausted your ability to produce and achieve. Instead of trying to resolve the immigration crisis like this, let’s move forward. And I think that’s what Reagan did, that’s what [President] George Bush did. We had two very different governors years ago. One in Texas and one in California, both Republicans. Pete Wilson in California tried to litigate, tried to limit the Hispanic vote by closing the door of opportunity, and George Bush did the opposite, by opening it. When you get everybody moving forward and producing together, a lot of the differences between us go away. María Cardona: But this is where I think the Republicans aren’t seeing the forest for the trees. Part of the contentious debate over immigration is because of fear and I think that comes from, to use your analogy, the boat is stuck in the water and non-Latino Americans are afraid that if more people come over or if they give the people who are here citizenship or rights, then the boat is going to sink. I think that instead of ignoring the problem, which I think Republicans have done, they like to say that they are focusing on the economy, but the fact is you can walk and chew gum at the same time. And I actually think that immigration is an economic issue. Studies have shown that if you give a pathway to citizenship to those hardworking Latinos who have been here, who are undocumented, there would be an injection into the economy in the next ten years of $1.5 trillion. Republicans, instead of stepping up to the plate and being leaders on this, like George Bush, like John McCain used to be, have kowtowed to the right-wing’s loudest voices. This gives the perception that it’s the majority of voices in the Republican Party right now. Latinos have started to take the rhetoric personally because of what has happened in the past. Mitt Romney right now is suffering from all of that past rhetoric as well as his own rhetoric when he tried to get the conservative vote. Alex Castellanos: In terms of Latino support, I don’t think Mitt Romney is suffering that much. He needs to get to about 35 percent of Latino vote to win the election and right now he’s at about 27 percent. He’s not far from where he needs to be. And President Obama has done a lot to solve our immigration problem. He’s created the economy. So more immigrants are leaving the United States than are coming in. Again, resolving this issue inside the box of scarcity and failure is impossibility. María Cardona: I don’t agree. For example, Republicans love to talk about vouchers, but the problem with vouchers is that there aren’t enough to go around, and most Latino children in this country live in urban areas where the only schools available are public schools and the vouchers wouldn’t cover the tuition anyway. From a realistic perspective and from the perspective of Latino parents who understand that good public schools are the anchor to that American dream, it is the Democratic Party that represents it best. Alex Castellanos: We’re fighting the wrong war. We’re fighting a war against each other when we ought to be fighting a war to win the future together. And nobody’s going to win the war we’re fighting now. So, I don’t think this is a policy problem. I think this in large part a prosperity problem. By litigating it as an “us versus them” problem, it’s a no-win situation. It [the issue of immigration] may be a difficulty right now, but we’re on our way to resolving it. But I think telling people that they can’t make it unless Big Brother gives them a helping hand lessens what Hispanics bring to the table. María Cardona: Nobody in the Democratic Party is saying that. What the Democratic Party is focusing and promotes as policies are policies that will actually level the playing field. Because unfortunately right now the majority of Latinos in this country are not rich. The majority of Latinos in this country are probably not even middle class. They’re working class, they’re trying to get there, and the policies that the Republicans are promoting will absolutely decimate the social safety net that right now does help Latinos take care of their families. Alex Castellanos: We had a road test of that in Wisconsin, where Democrats said that [Governor] Scott Walker was going to decimate the social safety network, the schools were going to collapse, the government wouldn’t work, and none of it proved true. He wasn’t recalled because the government hasn’t collapsed, the schools haven’t failed. Things are working in Wisconsin. So, guess what? It’s not the end of the world if you live a fiscally responsible life that allows our country to grow and prosper. Ruben Navarrette argues that neither party gives us respeto. That Democrats lie to us and that Republicans insult us. How do you respond? Alex Castellanos: I don’t accept that. I wouldn’t say that asking people to live by the laws that our country has made is an insult. Is there a right and a wrong way to come to America? Yes. If we don’t like the laws, then let’s change them. I don’t know any ethnic group that thinks it is entitled to be exempt from the laws of our country, and I think it’s demeaning to insist that you can only win the Hispanic vote if you absolve them from the same rules and regulations that everybody else has to follow. I’ve never heard Mitt Romney talk about immigration and not mention increasing legal immigration. Ever. More than any Republican I’ve ever seen, he believes in a country with strong hands but a big heart. Where we open doors so that more people can come to this country. But one thing about laws is you can’t make them up as you go along. Otherwise you have no laws. What about the concern some people have that the Democratic Party takes the Latino vote for granted? María Cardona: If you actually look at what Democratic Party is doing, that doesn’t hold water. Because right now both the DNC [Democratic National Committee] and the Obama reelection campaign is investing record amounts of money and resources in a way that they never have before. I have heard that in the past, and I have agreed with that in the past. I have told my party in the past that we can’t continue to take the Latino vote for granted. This year I have seen the president’s reelection campaign focus on the Latino vote like I’ve never seen them do before. They’re outspending Republicans right now 76 to 1 on Spanish-language television. They have had high-level Hispanic staff in place in Chicago for over a year and a half. They have been out talking to Latino leaders non-stop for the past two years. The White House has been doing it ever since Obama came into office. So I don’t see that as an issue in terms of taking the Latino vote for granted. President Obama knows very well that he needs to at least equal his performance with the Latino vote if he’s going to win this year. In the past we have taken the Latino vote for granted but I think in the last several years, Republicans have certainly helped us. What’s the bottom line? Do you think Latinos will decide this election? María Cardona: Yes, I agree. No question about it. Alex Castellanos: I think this year it’s going to be so close that every vote is going to be crucial, but I think the Hispanic vote is going to be decisive in some key states. What role are Latinos playing in the campaigns? Do you see that outreach from within? María Cardona: You have Katherine Archuleta, who is the political director for the whole campaign. You have Adrian Sáenz, who is the national Hispanic vote director. You have Gabriela Domenzain, who works in the press office. You have them at all levels, and you have them at the DNC and the White House. I see this in an unprecedented way, from a strategic perspective, I’ve never seen it done like this. Alex Castellanos: Which is good, and almost as good as what the Republicans are doing. And that is, not only at the level of a political operative, but if you look at who is actually under consideration to be part of the administration. For a party that’s doing so poorly with Hispanics, Republicans sure do seem to have a lot of them in high public office. You have [Florida Senator)]Marco Rubio, who is on everybody’s short list for vice president. You have [Governor] Susanna Martínez in New Mexico, you have [Nevada Governor)]Brian Sandoval. So you have a lot of candidates who are going to be considered not only for vice president, but for positions in a potential Romney administration. They represent that Republican message, which is, would you rather live in a country where everybody has an opportunity to achieve their dreams, or a country that kind of accepts economic failure with some programs to compensate for it. María Cardona: And that would be fine if most Latinos were in the one percent, but they’re not. Alex Castellanos: Most Americans are not in the one percent, and our message is not for the one message, it’s for everybody. Alex Castellanos: There are two wonderful parents in Washington, D.C.: Barack Obama and Michelle Obama. They have beautiful girls. They’ve chosen the best schools in Washington for them. Why don’t we let every American, every Hispanic family do the same thing? I think we should follow what the president has done personally with his family and make that opportunity available for everybody. María Cardona: If that were realistic for everybody, I would absolutely say yes. Alex Castellanos: Mitt Romney thinks it is. María Cardona: It’s not realistic right now. Alex Castellanos: What’s realistic is what’s not working right now.< This debate reminds us that you both are some of the few Latino pundits on television. Do you think we need more Latinos on the political shows? Alex Castellanos: It’s changing. On the Republican side, you have Ana Navarro, who is not just a bright mind but great fun. You are seeing more people. María Cardona: And I think that of all the cable channels, CNN has been the one that is focusing on that. They’ve sought people like Ana Navarro, Estuardo Rodríguez, and more people who are on English-language media. Alex has been there a long time; I’ve been there since last year. Alex Castellanos: I think we need more people on the network, on the news, who think cigar smoking should be mandatory. No doubt about that.